This comprehensive day tour takes you to some remarkable sights and attractions on Kangaroo Island. 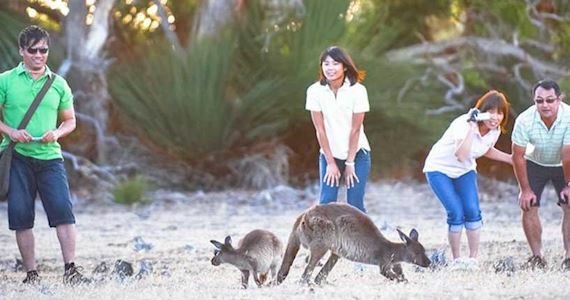 Travel in comfort on a modern coach and discover abundant wildlife, spectacular coastal scenery and unique landscapes at Kangaroo Island, South Australia’s premier nature-based tourism destination. To participate in this tour you must be on Kangaroo Island. There is no early morning connection from the mainland. After your morning hotel pick up, visit Clifford’s Honey Farm to enjoy an informative talk by the beekeeper followed by tastings and an opportunity to sample homemade honey ice-cream and honey beauty products. Next, travel to Hanson Bay Visitor Centre Café for a scrumptious two course lunch. After lunch you have the chance to look for Koalas nestled up in the eucalypts and see an abundance of native birdlife in the wildlife sanctuary. Next, travel to the western most part of the Island and Flinders Chase National Park, one of Australia’s largest and earliest conservation parks. One third of Kangaroo Island has never been cleared of natural vegetation and the thick eucalypt scrub is the habitat of many species of wildlife, much of which is uncommon or extinct on the mainland. After a short stop at the Flinders Chase Visitor Centre travel through the park and enjoy breath-taking views of its unique trees, plants and coastal scenery. You will be taken to the rugged southern coastline for a walk on Remarkable Rocks and Admirals Arch. Remarkable Rocks provide great photographic opportunities and stunning sea views. Admirals Arch boardwalk takes you down a rugged cliff face to reveal this spectacular arch, a natural nursery and safe haven for playful Long-nosed fur seals that can be seen swimming and playing in the waves, or resting on the rocks.